Younger Americans have long been less likely to read newspapers than their elders. But a Pew Research Center survey has revealed a significant twist, at least for certain newspapers with a more national focus: When we asked people if they regularly got news about the 2016 presidential election through either the print or online version of four specific U.S. newspapers, three of these papers – The New York Times, The Washington Post and The Wall Street Journal – attracted more adults younger than 50 than 50 and older as regular readers. As for the fourth – USA Today – younger and older Americans regularly got election news there at about the same rate. This reinforces earlier findings that when asked about reading, watching or listening to news, younger Americans are more likely than their elders to prefer reading it – though they overwhelmingly prefer to do this reading online. And the new data suggest that the digital outreach efforts for these national newspaper brands may have attracted enough younger online readers to overcome a long-standing age gap for newspapers. By contrast, this shift is not evident for local newspapers. Older adults were much more likely than younger ones to regularly get election news from their local daily papers, according to the survey, conducted Nov. 29-Dec. 12, 2016, among 4,183 adults who are members of Pew Research Center’s nationally representative American Trends Panel. Both The New York Times and The Washington Post were regular election news sources for about two-in-ten adults ages 18-29 and 30-49, roughly twice the rate of older age groups. For The Wall Street Journal, 15% of 18- to 29-year-olds and 12% of 30- to 49-year-olds regularly got election news there, higher than those ages 65 and older (7%), but about on par with 50- to 64-year-olds (8%). All age groups were about equally likely to get election news from USA Today. 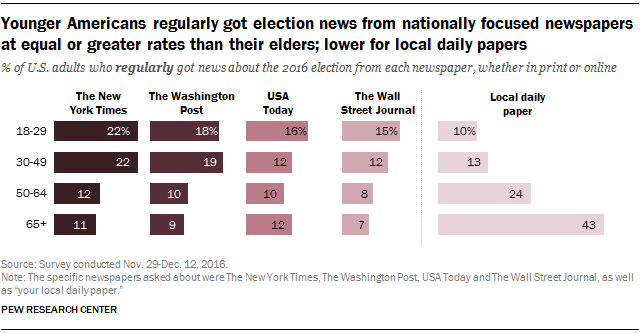 Compared with these nationally focused newspapers, a very different picture emerges for local daily papers, of which there are more than a thousand in the U.S. About four-in-ten (43%) of those ages 65 and older regularly got news about the election from their local daily paper, which is around twice that of those 50-64 (24%), and three or more times that of those younger (13% of 30- to 49-year-olds and 10% of those ages 18-29). In fact, for adults younger than 50, local daily papers were lower than or on par with any of the four national brands asked about, whereas for people 50 and older, local daily papers exceeded each of the national brands at least twofold. The Washington Post, The New York Times and The Wall Street Journal have aggressively pursued online audiences, which tend to be younger. And indeed, attracting these younger, digital readers may help grow digital advertising revenue and even subscriptions. Nonetheless, most publishers still rely more heavily on print dollars. In other words, attracting young readers may be just one step in securing newspapers’ future.